Now that we've gotten a fresh start for the season by making donations to thrift stores and tossing our clutter into baskets, let's concentrate on maintenance. It's always easier to keep up than catch up; that holds true for work, school, and our personal lives. 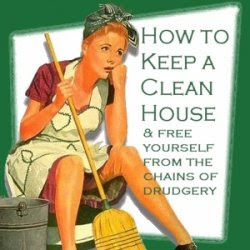 And have you noticed that a clean house equals a calmer house? And a calmer house equals happier, more fabulous family members? Only touch stuff once - put it away, don't put it down. If you have kids, use them - helping with the house is the job of all members of a family. Here's a great list of some age-appropriate chores for your children. 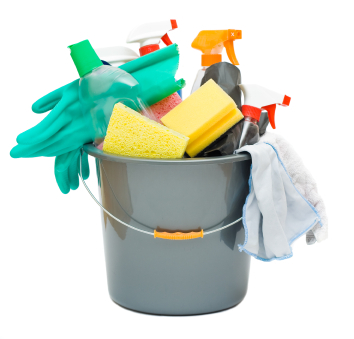 I also like to try and maintain an easy weekly schedule for household cleaning so I don't get overwhelmed or end up wasting my entire weekend scrubbing bathrooms. Spend fifteen to thirty minutes a day on chores and then let it go... I promise, if you keep up instead of catch up, your house will be plenty clean and you won't have panic attacks when someone calls and says, "I'll be right over!" And sometimes things get crazy and you fall behind. It happens to everyone, and it's okay. Don't be too hard on yourself, just do what you can and work to catch up... then go back to keeping up. The Husband and I have gotten really bad about housekeeping. The only time it gets a really good scrub is if we have company (I fall into the panic attack category!) I either need to have guests more often or make a plan like yours. I like a clean house, maybe I should make a plan!